We are delighted to announce the launch of a new Nursing Journal – Asian/Pacific Island Nursing Journal! 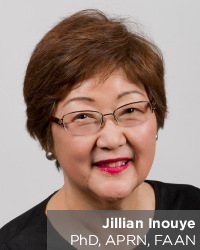 The Editor is Jillian Inouye, PhD, APRN, FAAN, who is on the faculty of Nursing at the University of Nevada Las Vegas. Jillian has also joined our own planning group for the 2015 INANE conference, which will be held in Las Vegas and is being hosted by Carolyn Yucha, Editor of Biological Research for Nursing. Please join me in welcoming Jillian and this new nursing journal to INANE! Description: Created to fill the gap between nursing science and behavioral and social sciences, Asian/Pacific Island Nursing (APN) offers a forum for empirical, theoretical and methodological issues related to API ethnic, cultural values and beliefs and biological and physiological phenomena that can affect nursing care.